June 29th is one of Chile’s national holidays that celebrates Saint Peter and Saint Paul. The holiday, or feriado, is called San Pedro and San Pablo. When this holiday is near a weekend, the date will often be moved to make a Friday or Monday holiday so Chileans can enjoy a long weekend. While this holiday officially commemorates both Saints, Saint Peter has a special place of honor in Chile on June 29th. Saint Peter (San Pedro) is the patron saint of fisherman. Fishing in Chile is a major industry. Due to Chile’s extremely long coastline, fishing is done the entire length of the country. You’ll find fishermen in small port towns along the coast that fish for their families or to sell at local markets. Other Chilean fishermen farm the seas and waterways to catch the fish that will be exported to countries around the world. 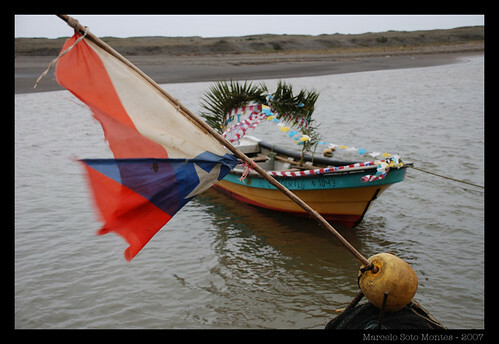 June 29th is the day where fishermen (and others) across Chile celebrate their patron saint. Locally, the celebration is called the Fiesta de San Pedro. A typical festival will begin with a traditional Catholic mass. The local fishermen will ask San Pedro for a good catch and that the sea will be abundant for their benefit. Prayers are offered for favorable fishing conditions and that the workers will be healthy and safe at sea. After the mass, a procession of people carrying images of Saint Peter will march towards the sea. Upon arriving at the water’s edge, the people will take to the sea in boats to continue the procession on the water. Boats are decorated with images of Saint Peter and the Virgin and decorated with colorful flowers. The boat procession will navigate around the local waters until finally ending the celebration when they return to shore.